All OPTIONS will be paid in a separate Ebay buy-it-now transaction. The OPTIONS AVAILABLE are: (1) CORN and MULTI-FUEL Conversion Kit add $200, (2) Surround or Flashing add $200 for Medium, $275 for large, (large shown in pic), (3) Gold Door add $200, (4) Chimney Flue Exhaust Kit add $545, (5) Direct Flue Exhaust Vent Outside and up 3 feet add $365, (6) Fresh Air Kit add $145, (7) Corn Screener/Cleaner $65, (8) Wall Thermostat: Digital add $72, Dial-indicator $35, (9) Remote Control Thermostat add $245, (10) Power Outage Module for $179, (11) Hot Ash Vac $249, (12) FANS Air Circulation Doorway Corner and Room-to-Room $40-$65, (13) Pedestal Base Mount is same price, (14) Low particle emissions of 0.60 grams/hr are available in a different HIGH QUALITY INSERT for another $1000. Note again to repeat: all Options will be paid in a separate Ebay buy-it-now transaction. A Power-Outage Module (Model I) is available at $179 to supply 115 VAC to your crucial electrical devices ... a smart item to have as backup in power outages. Use this module for POWER OUTAGES and you can run it from any 12 VOLT BATTERY either a Car battery or a Deep Cycle Battery. It supplies 1000 WATTS (Model 1) of 115 VAC POWER with two outlets and battery cables are supplied. There are other models (I-A through VI) available. Model V Pure Sinewave 1000 Watts, 100% Continuous-Connect, Auto-Switch, Auto-Recharge, Charger, see pictures 6-7...$999. Models II and V can be used as stand-alone chargers that are permanently connected to your stove (insert) and when the power goes out they will auto-connect to the battery backup. They are AUTO-SWITCHING. When the power comes back on they will automatically switch back to the wall 115 VAC Outlet (and re-charge discharged batteries). Pure Sinewave models (more expensive) are used in Canada and in the US where specified. Unless your equipment manufacturer specifies "pure sinewave", it should be OK to use modified sinewave (more economical). Any recommendations of using pure sinewave should be followed. There is a Warranty of as 5 YEARS on the heat exchanger, combustion chamber, door, any structural fabricated parts, etc., 1 YEAR Warranty on all electronics. Not covered under warranty: Glass, Gasket and Seals, Ceramic Bricks, Burn Pot, Paint and Powder Coating, Gold Plating, Inter Heat Shields, Gear Motor, Self Igniter, and Glass Saver. Be careful from whom you buy. 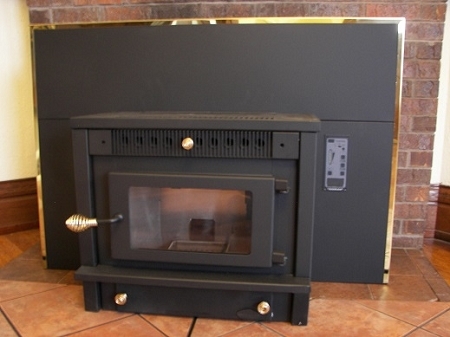 We are a Dealer specializing in wood pellet and corn stoves and can help you through your installation as well as and trouble shooting if necessary down the road. Be careful as others do not have the capability to do that.